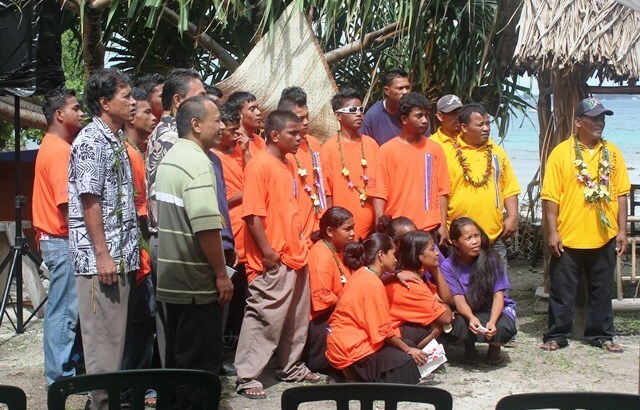 About 60 people gathered at the picnic area next to WAM on the afternoon of Friday, October 2, to witness the happy graduation of 20 trainees. RMI National Training Council head Alison Nashon and WAM Director Alson Kelen were amongst those who made speeches, in part congratulating the graduates. A highlight was the fact that a number of the trainees will move straight into employment, following successful internships at local businesses during the training period. Congratulations to all! Graduates: Arinton Aister, John Bujen, Richie Aikam, Joti Latrik, Anje Banjo – overall top student, March Lakson, Helino Haini, Neil Lakmij – best in safety, Jammy Edwards, Reghie Lucky, Jackhead Francis – best in life skills/counseling, Dalmer Menwe, Jacklyna Jetea, Janen Torelik, Michaelson Jihu, Jeitha Jennop, Jamison Jack, Jacklick Kamo, Rolton Kaiko, Junior Heine- attends Assumption Middle School and was one of the trainees whom graduated with the above trainees and was awarded with a Certificate in completing the WAM Summer Training program. My joie is Ejowa and I live in Rita with my mother and father, brothers and sister. I am 22 years old and I graduated from Marshall Islands High School in 2011. Right after high school I enrolled in CMI (College of the Marshall Islands) and took developmental English and Math. After three semesters, I decided I needed to find a job that would let me contribute to my family’s finances. I worked at a small store in Rita for a while, but it was not what I really wanted to do. I couldn’t go back to school because I owed the school and had no way to pay it back. I was feeling kind of lost and not sure what to do for myself, so this year, when one of my friends told me about the canoes program, I applied and was accepted. I wasn’t sure what I wanted from the program, except I heard that I would learn about my culture and that It might help me get a job. I did learn about my culture. I learned about the names of the parts of the canoe and how they are related to our culture and what they mean in our culture. I learned how to sail a canoe, which was very exciting for me. But I learned so much more. I learned how to use hand tools and power tools and how to measure using a measuring tape. I learned how to work with patterns and designs and how to put things together carefully. I learned how to follow instructions. But I also learned about myself. I learned about self-discipline, about achieving goals, about being part of a group. I learned that I can do anything a man can do if I just learn how. I would like to thank my counselor Tolina Tomeing for her guidance and help. I would like to thank the carpentry instructors Linton, Binten, Maston, Isocker for teaching me carpentry. I would like to thank Linton for helping me with math. I would especially like to thank Binten and Linton who taught me how to sail the canoe, even though I am a woman. I would like to thank Ken for teaching me how to build a rowboat and how to manage time. I would like to thank Bonny for helping me improve my English skills in reading, writing and speaking Englih. And, finally, I would like to thank Mr. Kelen for letting me in this program and for giving us all this opportunity to improve ourselves as Marshallese citizens. The graduating class of 2014 with counselor Tolina Tomeing (in blue). US Ambassador Tom Armbruster not only bought one of the dinghies made by the WAM trainees, he also rowed it home with his best friend Skipjack. Chief Secretary Casten Nemra made the keynote address at the WAM graduation held Tuesday, September October 2. 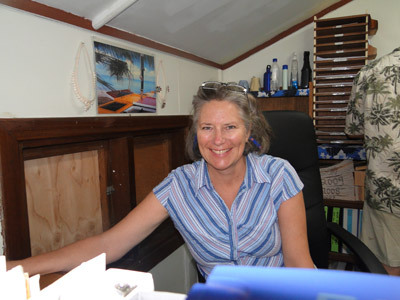 Australian Volunteer Jane Evans played a key role in the training of WAM’s Class of 2013, which saw the trainees graduate in December of 2013. A large crowd attended the ceremony, held next to the Canoe House in the grounds of the Marshall Islands Resort. These included Alison Nashion, the head of the RMI National Training Council, which is a strong supporter of the WAM program. A key speech was given by long-time friend of WAM, Marshall Islands Resort’s General Manager Hirobo Obeketang. 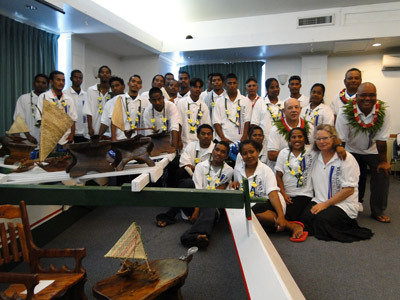 Graduates pose with a large scale model canoe at the graduation. Hirobo Obeketang, the Marshall Islands Resort General Manager and long-time supporter of the WAM program, gives a key speech at the 2013 graduation. English and Math instructor Jane Evans presents one of the graduates with his certificate. The WAM trainees and directors for the 2011-12 program pictured from left: (Back row) Stanley Joram, Henty Juano, Jeffery Rison, Jata Kilon, Lien Jorren, Simpson Tokjen, Turner Langinbelik (leaning forward), Mark Jacklik, Winton Boon (slightly hidden), Brik Kadu, Anthony Bwijo (trainer in training), Rowley Kaneko, Rinkey Hersey (half hidden), Bramond Clanry, Alaska Kilon, Mentil Laik (trainer), Priscilla Ainri, Linton Baso (carpenter), Helmera Bujen, Manto Samuel (trainer in training), and Alson Kelen. (director, front) Jason Ebot, Mack Jelmak, Lora Jerilong, Wina Jamomo, Ken Taggart (instructor), Sakura Edwards, and Kathy Hutton (associate director). The challenge for many non-government organizations (NGOs) in the Marshall Islands is that donor organizations provide funds for programs and then require hard data to prove that the program has been a success. For example, tests can clearly show how trainees have improved in math and English or their ability to use woodworking equipment, but life skills are another matter. The current six-month vocational trainee program at WAM is nearing an end, with graduation set for this Friday. “Over the months I’ve seen huge increases in confidence and self-esteem amongst our trainees, but how do you calculate that and provide it as evidence? 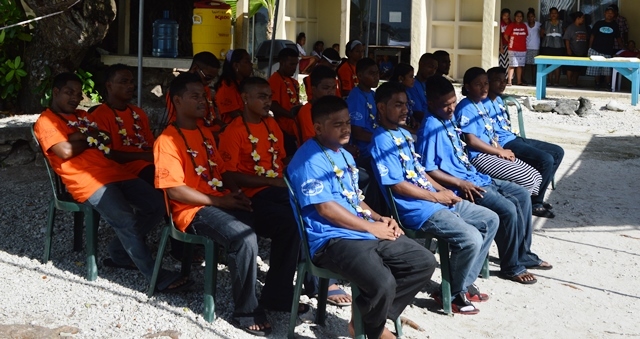 Twenty-five youth were accepted into the program, which began on August 1, 2011 and is funded by the RMI National Training Council. “In the first few weeks we had a couple of dropouts, but these were quickly replaced by other applicants. One or two more dropped out over the months, but we’re ending the course with 22 trainees. Taggart also helped train four young men to be trainers, two of which are from Ebeye and two from Lae. The hope is that this group will return to their home islands to run similar courses.